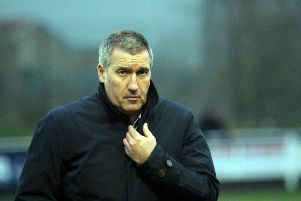 It was definitely a birthday to forget for Banbury United manager Mike Ford. Ford, who was feeling unwell prior to the match, was left feeling even worse following Saturday’s 3-0 Evo-Stik League South defeat Royston Town. He said: “It was the worst birthday I can remember. I felt absolutely shocking on Saturday so I thought I’d go and see my side play well and win. “But it was possibly the most gutless performance I’ve seen from any side I’ve been in charge of at the club. We didn’t turn up in either half, no excuses we got beat by the better team and deservedly so. “We didn’t have a structure, it was as though the players didn’t know what to do.